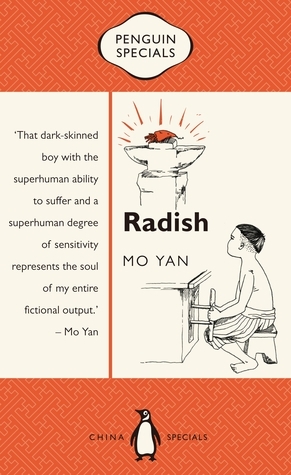 I am not often flummoxed by a book, but Nobel Prize winner Mo Yan’s Radish tested my ability to interpret a writer’s purpose. It seems to be an allegory for China’s Great Leap Forward but this was not something that sprang immediately to mind while I was reading it. Reading it, I was simply overwhelmed by the suffering of the central character, a little boy called Hei-hai, and puzzled by the behaviour of the characters in general. Radish is one of a series of Penguin Specials, marketed as short books designed to ‘fill a gap’, and designed to be read in a single sitting. Suitable for the commute, the lunch break, or between dinner and bedtime, they say. Radish is only 86 pages long and the prose is simple and easy to read. But it manages to convey striking ideas, where the reader has enough knowledge of the subtext to recognise them. Like all writers in China, Mo Yan is writing under the constraints of heavy-handed censorship and so there are allusions to events and perhaps to people that are not immediately obvious. The reader has to be in the know, and I think it’s a safe bet to say that most westerners don’t know much about Chinese history. It’s possible that young people in China also aren’t much in the know, if their ignorance of their own history is as widespread as Linda Jaivin suggested in The Empress Lover. It took more than one re-reading for me to notice the first allusion. The leaves of the scholar tree turning yellow refers to the autumn of intellectual freedom and the coming Cultural Revolution (1966-1976). This year, 2016, is the fiftieth anniversary of the beginning of this disastrous period of China’s history . But you also need to know something about Chinese history to recognise that this team leader is an emblem of corrupt leadership and greed. This is a village in the period of Mao’s man-made famine (1958-1961), and this man has his hands full of food. But – even though he is the most powerful person in the village and that power rules all their lives – he has to conceal this abundance of food from the crowd of puppets who must dance to his tune. It helps also to know that Mo Yan was born in 1956, he lived through this period of famine, and his early life was spent working in the fields, dreaming of food. (See Julia Lovell’s article in The Asian Review of Books, Sept 2012). The team leader has gathered the people together to fulfil a quota. The commune is widening the floodgates behind the village and their orders are that the village must send along a mason and an unskilled labourer. You need to know something about the other quotas imposed from on high (the ‘higher-ups’ as Yan Lianke calls them in The Four Books also set in this period) to know that losing two workers for this new project makes it harder for them to fulfil their existing agricultural quotas and to have some left over for the village food supply. From the team leader’s remark that sending ‘a woman makes the most sense’ we gather that men make a greater contribution to the other work they have to do, but the women are needed to pick the cotton. This is harvest time. His gaze falls on Hei-hai. Hei-hai has a jutting breastbone (p.2) … a skinny neck that seemed in danger of snapping off from the load it carried (p.3) … rail-thin arms (p.3) and his bare back makes the villagers feel cold. Even the team leader recognises him as a pitiful thing. (p.3) As the mason explains to ‘Director Liu Taiyang’, (the commune’s cadre in charge of the floodgates project), Hei-hai’s father has gone off to the north-east like a man possessed and hasn’t been home for three years. He might be bear food by now or lying in the bellies of wolves. (p.7) (I deduce from this that he is ‘possessed’ by the State and is in detention somewhere or possibly dead, possibly an allusion to Chinese cannibalism in this period). Hei-hai lives with his stepmother who has self-evidently failed to take care of him. She makes him barter their dried yams for alcohol, and she is brutal. Am I reaching too far if, from the mason’s ironic rejoinder to the cadre’s complaint that the boy is useless, I interpret this step-mother as Socialism? So, Hei-hai goes to work. But he has a terrible time. He accidentally hammers his own finger when he is breaking rocks, an injury severe enough to be reassigned to working the bellows at the forge where they repair the hammers endlessly damaged by the work of breaking rocks by hand. But his skin and hair become ingrained with coal dust; his bare arms, legs and torso are burned by sparks from the forge, he burns his hand when he picks up a hammer fresh from the fire; he is in and out of the freezing water of the river; and while others rug up against the increasing cold, he has nothing but his shorts to wear. Yet he suffers all this with not a word of complaint, not even a whimper. He seems not to feel anything and has a capacity to endure that is greater than any adult’s. He bears his burdens by choosing only to notice what’s beautiful around him. His eyes, big and bright to begin with, now shone like searchlights as he witnessed a strange and beautiful sight: a soft blue-green light suffused the sleek surface of the anvil, on which rested a golden radish. In shape and size it was like a pear, though it had a long tail, every fibre of which was a strand of golden wool. Glittering and transparent, exquisitely limpid, its golden skin revealed a swirling silvery liquid inside. Its contours were clean and elegant; golden rays spread out from its beautiful curves, some long, some short – the long rays like beards of wheat, the short like eyelashes – and all were gold in colour. *chuckle* It’s taken me three times as long to write this review as it did to read the book! Available from Fishpond Radish (Penguin Specials) and good bookshops everywhere. I appreciate you taking the time to write this review. My knowledge of Chinese history is poor, and reading your review, I feel like I have gained some insights. I also had no idea Penguin has released this series. To capitalize on the success of their Little Black Classics, no doubt. There’s another one in this series to watch out for, called Marrow by Yan Lianke. I haven’t been able to find a copy yet.